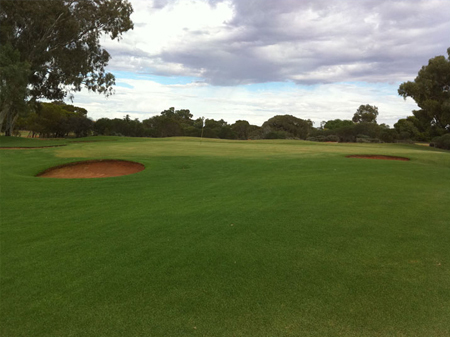 With the beautiful Flinders Ranges making a spectacular backdrop for Port Augusta's Golf Course, 18 fully grassed greens and fairways and a licensed Club, the course is considered one of the best country courses in northern South Australia. The club hosts the Port Augusta Golf Classic in the first week of August, attracting 300 players for 7 days of competition. Visitors with an AGU official handicap are welcome to join in the competions, if not, pay your fees at any other time and play by yourself or check at the club house for a partner. The Club is staffed by volunteers and is open every day from 8am to 4pm. The Bar is open Tuesday and Thursday from 3pm until approximately 6pm and Friday's from 5.30pm. Limited golf club hire and buggies are available from the club house, but you can also hire the equipment from the Standpipe Gulf Motor Inn on (08) 8642 4033. Visitors are welcomed at any time.